Factual error: Joe Jackson batted left-handed in real life, not right-handed as Ray Liotta portrayed. He also threw right-handed and not left-handed like it shows when Kevin Costner is hitting him fly balls to left field. Visible crew/equipment: On some shots which look back at Ray when he's driving his pickup, it can be clearly seen at the bottom of the picture that the front wheels of the pickup are sitting on a trailer, which is itself being towed by the camera vehicle. Continuity mistake: In the scene where Ray has a catch with his father, Ray's brother-in-law's Jeep can be seen parked near the light pole along the third base line. In the next shot, the Jeep isn't there. When the shot again changes and the camera pans back, the Jeep is back by the pole. Continuity mistake: When Ray and Annie are at the PTA meeting, it is night when they go inside, but when they come out after Annie gets into the argument with the other woman, it is day (there is sunlight coming through the windows). Continuity mistake: While Ray and Terence Mann are at the Red Sox game, they receive a message on the scoreboard - but the time and score don't reflect what Ray has written on the scorecard on his lap. Before Ray hears the voice it is 8:41, but right after it is 10:30. Continuity mistake: In the scene Costner is chopping up his corn crop with a flail hopper, the PTO that drives the machine is not rotating. Character mistake: Chick Gandil mispronounces Eddie Cicotte's name, calling him "Si-coty" instead of "See-cot." Factual error: When Ray is in the feed store, he picks up a bag of seeds from the counter and casually walks out. These bags of seeds weigh 50 pounds, so to lift it in the manner he did would require a great deal of strength. Continuity mistake: During Terrance Mann's "people will come" speech, the sun moves around quite a bit. The scenes of the baseball players have long shadows. The scene with Ray has the sun overhead. When Karen falls it is late afternoon again. When Doc leaves it is early evening. From Shoeless Joe's angle it is late morning. Continuity mistake: Near the beginning, as Ray has a vision of the baseball field, look at the difference of the angle of the sun. During the beginning of this sequence it's near noon. When Ray sees the field materialize the sun is obviously further west in the sky. Then, at the end of the sequence it is noon again. Continuity mistake: The sun changes considerably when Doc is leaving to walk into the corn and the previous and following shots. When it cuts to Shoeless Joe, the sun is at his back. Back to Doc leaving, the sun is setting. Continuity mistake: The clock at Fenway jumps two minutes in very little time from 10:30 to 10:32 in the space of two short scenes. Continuity mistake: During the first practice, the sun changes from late afternoon initially to midday and back to late afternoon throughout the sequence. Ray Kinsella: I know more about farming then you think I do. Mark: Well then how could you plow under a major crop? Ray Kinsella: What's a crop? 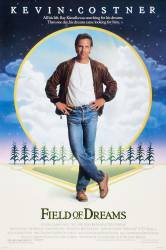 The town in Iowa that the movie was filmed in was Dyersville. The actual house and farm used in the movie are about 2 miles outside of town and are open to the public.